The latest from Miguel Gomes (Tabu, Our Beloved Month of August) Arabian Nights (As mil e uma noites) is probably this year’s most ambitious cinematic undertaking, and the most talked about film experience of the last Cannes Film Festival. Arabian Nights uses the framing device from the original Arabian Nights of the beautiful young Scheherazade telling tale after tale in order to keep her murderous husband from killing her—but that’s where the similarities end. Over three features, Gomes channels the current struggles of economically depressed Portugal through an assortment of tales that range from farcical yarns to grounded accounts of social issues. Volume 1 – The Restless One: After opening with overlapping documentary portraits of a shipyard and a wasp-exterminator, the director appears on screen, contemplating his overly ambitious undertaking. From here, Gomes spins a satirical tale about the financial powers-that-be preying on Portugal’s vulnerability. 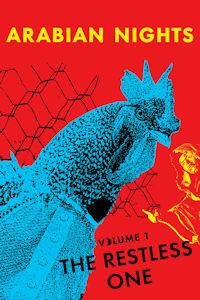 Next up is the comic story of the role a rooster plays in a local election, followed by a sobering triptych of interviews with unemployed citizens. Volume 2 – The Desolate One: The volume's opening chapter is about a criminal on the run. In “The Tears of the Judge,” a public trial becomes a mockery, with the testimony implicating everyone in attendance. 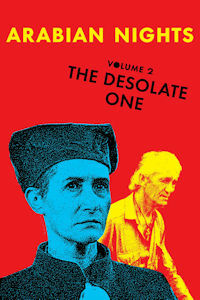 Finally, The Desolate One ends on an exhilarating note, with a hugely entertaining story about a dog named Dixie who’s passed between owners, familiarizing us with the inhabitants of a working-class apartment building. Tthe 3 disc DVD also includes Miguel Gomes' short film Redemption. 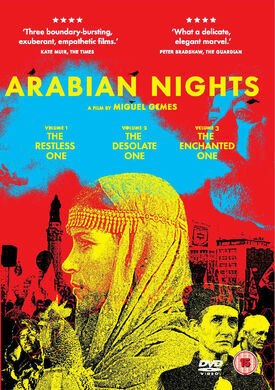 Arabian Nights is a joint acquisition of New Wave Films and MUBI. Miguel Gomes was born in Lisbon in 1972. He studied at the Lisbon Film and Theatre School and between 1996 and 2000 worked as a film critic in Portugal. He directed several short films that were screened all over the world and went on to win awards in Oberhausen, Belfort and Vila do Conde. The Face You Deserve (2004) was his first feature film. In 2008, his feature-length film Our Beloved Month of August was shown in Cannes’ Directors' Fortnight. His next film, Tabu, was selected in the Berlin Film Festival Competition in 2012, where it won the Alfred Bauer and FIPRESCI awards. It was subsequently distributed in the UK by New Wave Films. Arabian Nights, a three-part feature film inspired by the tales told by Scheherazade and the events that occurred in Portugal in 2013 and 2014, premiered in the 2015 edition of the Directors’ Fortnight in Cannes. 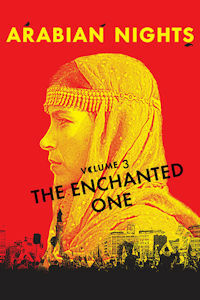 ★★★★★ 'One could only be lookng forward to the third and final volume of Portuguese director Miguel Gomes's Arabian Nights trilogy. The Enchanted One ends the magic voyage between the veiled curtains of Arab courts and crowds protesting in Portugal...like King Sharyar, we just long to hear more. 'The really outré attraction of the festival, in the end, was in Directors’ Fortnight – the six-hour, three-partArabian Nights from Portuguese experimenter Miguel Gomes. This is not an adaptation of the old tales, but an attempt to engage with Portugal’s economic crisis, using Scheherazade as a structuring device. But this doesn’t begin to convey the inspired oddity of Gomes’s epic, a barely categorisable encyclopedia of a film. It takes in documentary, mock-documentary (with non-professionals playing themselves), Brechtian theatre, and cod-exotic sequences featuring camels, genies, princesses and even an exploding whale. It was the most authentically crazy film on show here, the biggest splash of true innovation in Cannes, and an unmissable art event. ‘A film about protest rather than a protest film. It’s an improvised, on-the-lam masterpiece, a lopsided folk-art shrine, which finds genuine hope (rather than erroneous cinematic hope) within a context of incomparable despair. ‘Truly remarkable. ‘A sprawling, angry, comical extemporization on the state of Portugal - a gallimaufry of personal testimony and imaginative mythologizing. ‘The two masterworks that defined Cannes 2015 were Miguel Gomes’s wild and sprawling Arabian Nights and Apichatpong Weerasethakul’s Cemetery of Splendour.